OK, this is a weird one, folks. 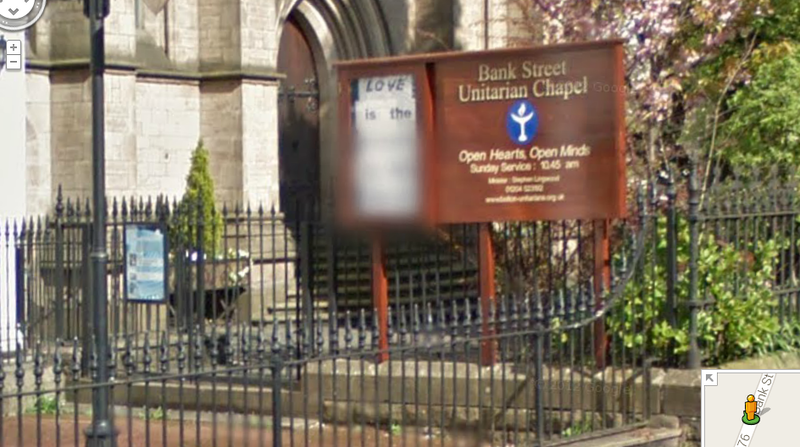 I was wandering around Google street view, as you do, and checking the street view of my church. I could see that is was a relatively new shot as it has our (relatively) new noticeboard on. I zoomed into the noticeboard to get a better look. Everything else is clear enough on the noticeboard. You see "LOVE is the..." but rest of that looks like it's been deliberately edited out like they do with everyone's faces on Google street view. I can't think for the life of me why anyone would do this. How curious. Google blurs personal information, detected by algorithm -- including bunches of signs. 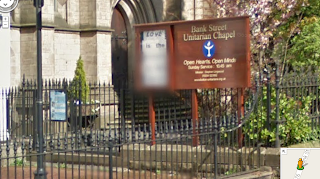 It isn't perfect, but I bet the church phone number would have been blurred has it come in clearer. Its the license plate detection algorithm. The board like shape and density of the letters triggered it, I'd guess, where the first two lines probably scored a little lower on the heuristic. There is a face detector too, but I think it is more likely that this is a case of the license-plate detector. It's probably an error in the number plate detection algorithm. Something about the words at the bottom of the sign looked like a car number plate to Google and so they blurred it out in an attempt to preserve anonymity. If you write to them and demonstrate you're the minister they will probably be able to un-blur it. Are Christians being persecuted? No. "Sharp fall in young ministers"?